At 17, Veronica O’Shay is happier running wild on the family farm than behaving in the ladylike manner her mother requires, and she despairs both of her secret passion for her brother’s friend Jack Murphy and what promises to be a future of restraint and compliance. But this is 1913 and the genteel tranquillity of rural Beecroft is about to change forever as the O’Shay and Murphy families, along with their friends the Dwyers, are caught up in the theatre of war and their fates become intertwined. From the horrors of Gallipoli to the bloody battles of the Somme, through love lost and found, the Great Depression and the desperate jungle war along the Kokoda Track, this sprawling family drama brings to life a time long past… a time of desperate love born in desperate times and acts of friendship against impossible odds. A love letter to Australian landscape and character, Gallipoli Street celebrates both mateship and the enduring quality of real love. But more than that, this book shows us where we have come from as a nation, by revealing the adversity and passions that forged us. 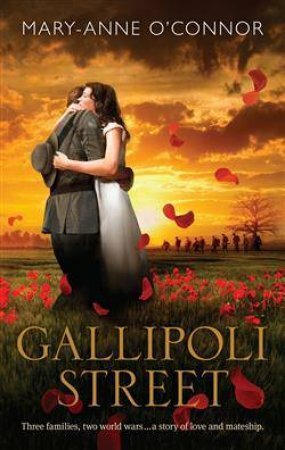 A stunning novel that brings to life the love and courage that formed our Anzac tradition. This was a slow starter for me. But once it got going, heartstring after heartstring was tugged at, some broken all together. Galipolli Street is a sweeping romance set amongst the turmoil of multi-generational wars, bloodshed, laughter, tears, heartbreak and reconciliation. Following the lives of first the parents and then their children as each embarked on their own journey of war and life was an absolute privilege. Mary-Anne O'Connor has written an incredibly beautiful book covering an area of Australian history that remains relatively untouched and she does it with poise and elegance. The characters are well formed, fragile, funny and beautifully charming, all in their own individual ways. Veronica O'Shay is probably my favourite of the bunch, followed closely by Jack Murphy, I fail, at this moment to recall any other characters in any book with such depth and well-rounded histories. This book had me laughing, crying and hoping in various stages and degrees throughout. I loved it in so many different ways that I'm not able to adequately explain how truly excellent it was.